Yeah, let’s not do that. Let’s keep the fat happy. For now. So let’s keep the heat outside with this quick and easy meal! 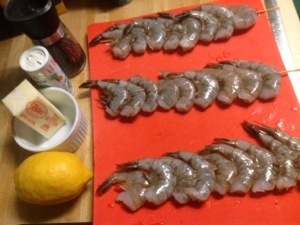 Gather your ingredients: Large shell-on and deveined shrimp, butter, lemon, salt and pepper, and skewers. You can use either metal or wood skewers, but I had some bamboo skewers on hand. You really should soak wood skewers before you put them on the grill so they don’t burn, but I got away with running them under some cold water for a minute. 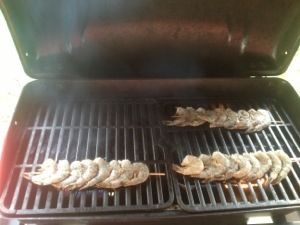 Fit your shrimp onto your skewers leaving room at both ends so they don’t slide off. 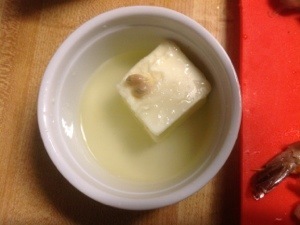 Melt some butter in a microwave safe dish and add in the juice of 1/2 lemon. 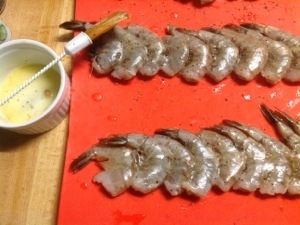 Brush the lemon butter on either side of the shrimp. 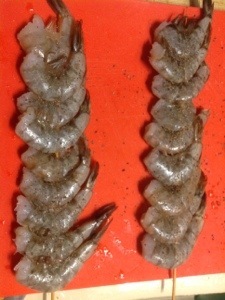 Season each side with salt and pepper. Seasoned salt, old bay seasoning, garlic and/or onion power would make good additions too. Warm your grill for a few minutes to get the heat circulating. 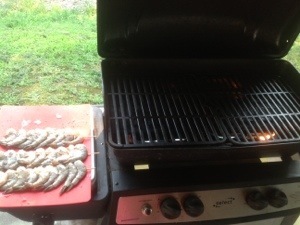 Carefully place each skewer on the grill in a place where the flames are low. High flames will cause the shrimp to burn and the shell will stick to the flesh. We don’t want this, this is bad. 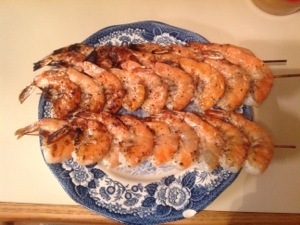 Well cooked shrimp is what we are going for. 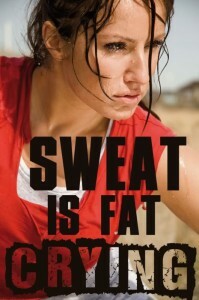 Cook each side for about three minutes, remove from the heat and enjoy! If you are feeling exceptionally ambitious, melt more butter in the microwave and add the juice from the rest of your lemon. Voila! Lemon butter sauce. Quick, easy, and most importantly delicious! 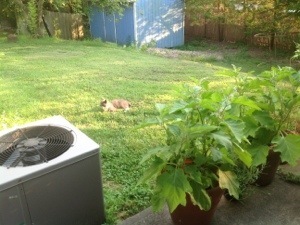 Keep the heat outside tonight and enjoy everything your AC has to offer! Aloha! Another one of my sous chefs!